The word Hapkido consists of three words: (Hap) means coordination , (Ki) means energy, power, and (Do) means the way, path, or style . Hapkido is a martial art of Korean origin. It is name means literally ”The way of coordination and internal power” . Hapkido is a complete martial art in that it consists of dynamic striking and kicking techniques, a hard and soft style deflection techniques, throws, takedowns, ground fighting, and extensive joint locking techniques. 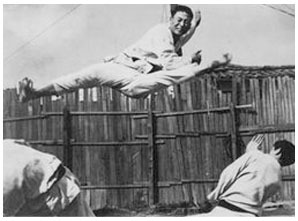 Hapkido is the combination of two Korean Martial Arts - Yool Sool which comes from the Japanese art known as Daito-Ryu Aiki-Jutsu and Tae Kyon which is an ancient Korean Kicking Skill that was widespread during the time of the Three Kingdoms. Those principles do not mean to kill or eliminate the attacker, but it is fair enough to hurt or cause harm to him in a way that the attacker would not be able to continue his attack, so he will escape or run away of the fighting situation . 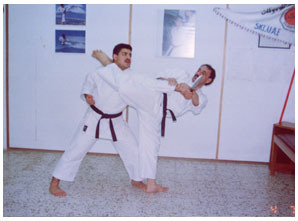 Hapkido is the combination of Karate, Taekwando, Judo, Aikido, and Jujitsu Techniques . Hapkido is a martial art used for street fighting or defensive tactics rather than competitive or sports oriented training. Hapkido techniques include strikes, punches, kicks, joint locks, chokes, pressure points, throws, pins, grappling, and ground fighting . Modern Hapkido training is ideal for anyone who is looking for training that is focused on self protection. This training deals with how to defend yourself in real situations; in the street, a parking garage, or any place you need to defend yourself or the people you care about. Modern Hapkido is 100% self defense, there are no forms. Kicks are directed to the lower part of the body, and no acrobatic skills are required to use these kicks. Modern Hapkido employs throws in a very limited manner and does not require any unusual strength to execute its techniques. It obviously is better to be strong than weak, but awareness and good technique will improve your chances of surviving/escaping regardless of your size/strength.